If the Xiaomi Redmi 1S shows a dark screen display it means that the Display Light on it is not working or caused the problem. This solution below might possibly help fix the Samsung Galaxy Grand Prime with Display Light Problem. The Xiaomi Redmi 1S is powered by 1.6GHz quad-core processor and it comes with 1GB of RAM. The phone packs 8GB of internal storage that can be expanded up to 64GB via a microSD card. As far as the cameras are concerned, the Xiaomi Redmi 1S packs a 8-megapixel primary camera on the rear and a 1.6-megapixel front shooter for selfies. The Xiaomi Redmi 1S runs Android 4.3 and is powered by a 2000mAh removable battery. It measures 137.00 x 69.00 x 9.90 (height x width x thickness) and weighs 158.00 grams. 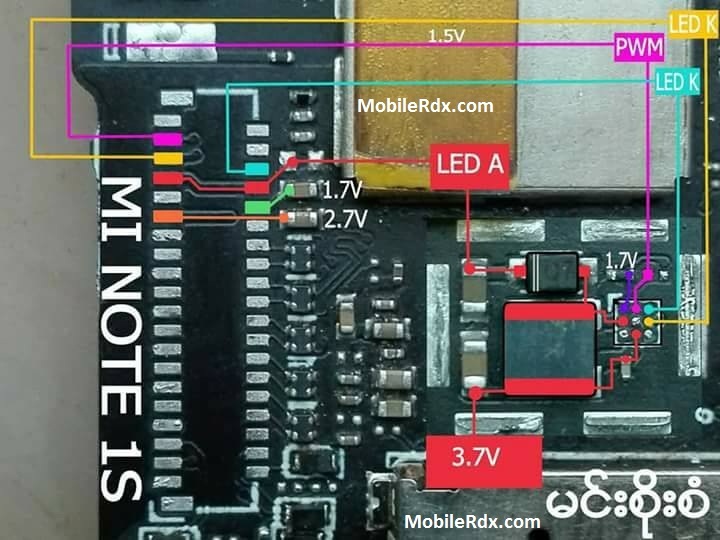 Here are Xiaomi Redmi 1S Display Lights jumper ways. Please study these diagrams very carefully before you start repairing. – Visually check the flex connector, if oxidized, clean it. – Check the 3.8V battery voltage across the filter coil. Check/replace also the coil. – Trace the LED+and LED – connection line paths from the flex connector down to the capacitor and resistor where it is connected. – Replace the Display LED Driver IC.